Fall is now embracing our days, the streets are covered with yellow leaves, the sea is getting grey, the air dry and chilly. Chestnuts, mushrooms, apples and pumpkins sit enthroned on the market stands. All these flavours keep me company and confort me in the kitchen when outside the wind is blowing. 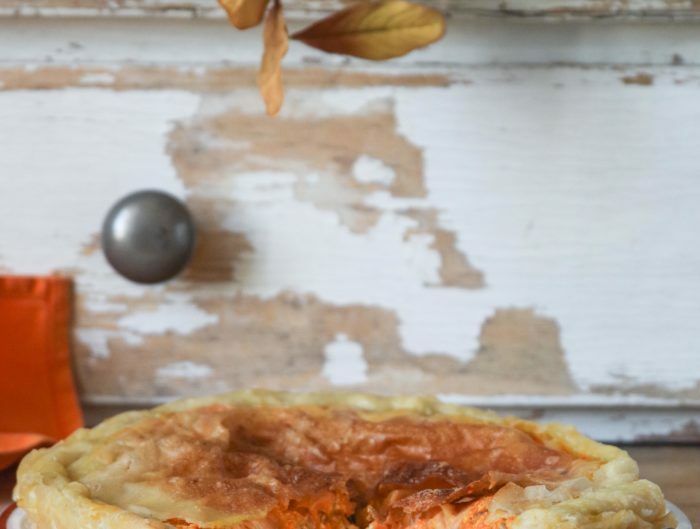 For this reason I think that these seasonal foods need to be celebrated and this is why today I want to tell you that there is a small historic village just behind Genoa where each year on November for celebrating the patron saint a great Pumpkin Fair takes place. This place is Murta, a bunch of few houses clinging on the slopes of Valpolcevera where in the nineteenth century the nobles’ families of the city used to spend their summer holidays in the countryside. Today this is a residential neighbourhood where county life is no more than a tradition, but still a peaceful place spotted with elegant aristocratic villas. This year the 30th Pumpkin Fair will take place. It is a very popular exhibition, well known at national level. For two consecutive weekends of November (this year 12-13 November and 19-20 November) pumpkins are celebrated under any aspect. There will be a competition for awarding respectively the strangest, the nicest, the biggest and the longest pumpkin and a competition among florists for the best decoration with pumpkins. Needless to say there will be also many food stands for tasting the traditional recipes where pumpkins are the great heroes. 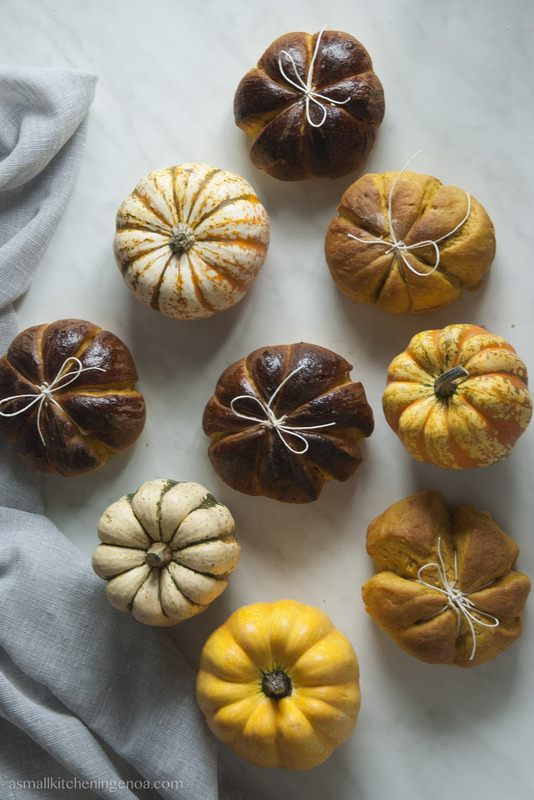 One of these traditional recipes are the pumpkin buns, which I decided to cook and share with you for my very personal celebration of the pumpkin. Murta pumpkin buns traditionally are sweet and the original recipe provides that granulated sugar is spread on the surface before baking. However, as these breads are not that sweet, I do not cover them with sugar and serve them during meals as well. They are in fact very good companions for chees and hams… or just for glutton diners! 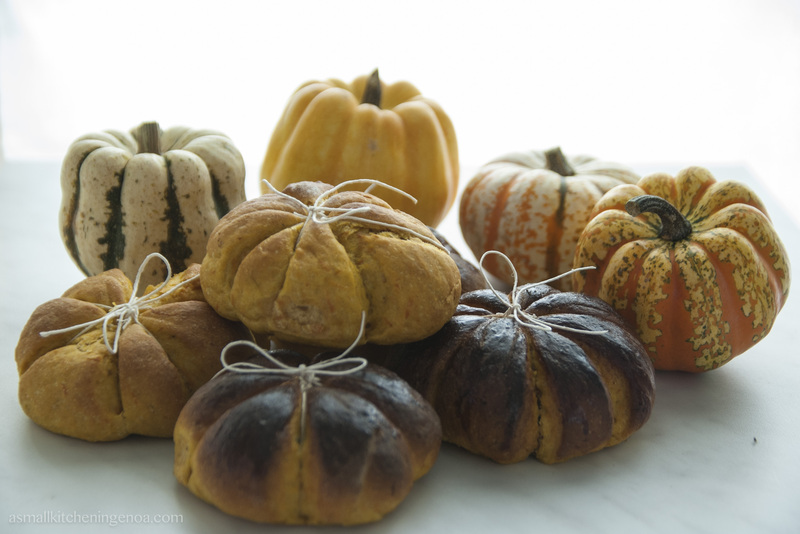 Their pumpkin shape is not part of the tradition – it’s just a poetic license.. Melt the yeast in few lukewarm water, add the honey and whisk. Knead the fIour with the remaining water, add the yeast and keep on kneading until the dough is soft and elastic. Make a ball and let it rise in a bowl covered with a cloth and far from draughts for 2 hours. Clean the pumpkin, cut it into slices of ab. ½ in (1 cm) and cook them in the oven at 180°C (350°F or gas mark 6) for 30 minutes, or until the pumpkin is soft but not roasted. Smash the pumpkin with a fork or a vegetable mill until you obtain a purée. When the bread dough has raised for 2 hours, melt the yeast in very few lukewarm water. 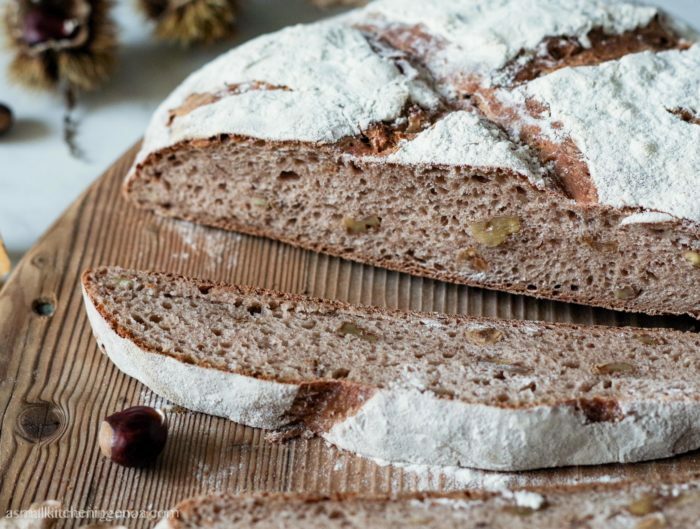 Pour the flour in a big bowl or in the kneader, add 17 oz of pumpkin pure, 7 oz (200g) of the raised dough bread (weight it because you probably have kneaded a little bit more than actually needed), the sugar, the melt butter, and the yeast. Knead for some time until obtain a dough soft and elastic. If it’s too sticky add some flour. Make a ball and leave it rise in a bowl (previously greased with oil) covered with a cloth and far from draughts for 3 hours. When the raising is completed, flour a work surface, remove the dough from the bowl, lay it down on the work surface (it will deflate, its normal). Divide it into pieces slightly smaller than a fist and form small buns. 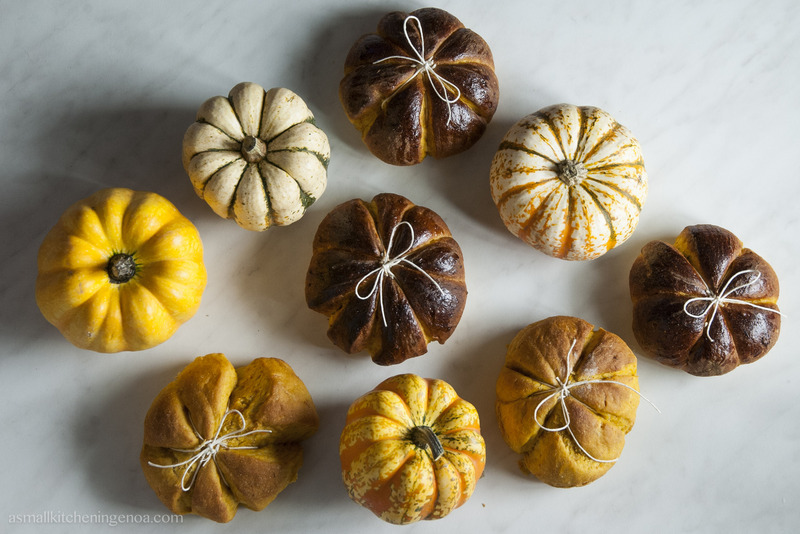 To give the rolls a shape of little pumpkins, take some kitchen string and bend it around the rolls dividing them in 6 or 8 slices. Do not tighten them too much as during the final rise and baking the dough will increase its volume and get the pumpkin shape. Lay down the rolls on a baking tray covered with baking paper and leave to rise for another 20 minutes. Brush the buns with some beaten egg and bake in the oven for about 20 minutes, or until golden and springy. Leave to cool. please try them and give me a feed back! !